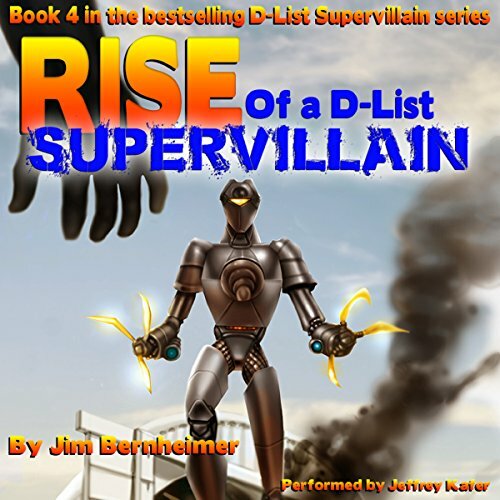 Cal Stringel returns in the fourth volume of the D-List Supervillain series! One of the few heroes he respects has been captured, and now, Cal must rely on his wit, technical skills, and a healthy dose of The Big Lie, to pull off a daring rescue from inside a villain's base. Along the way, he and his team of New Renegades will have to worry about an imposter, human/animal Manglermal hybrids, a naked woman, an evil scientist, a terrifying plan, and the ever intrusive presence of Big Brother. Can Cal keep the fact that he's really alive a secret? What hidden truths has Aphrodite been holding onto and how will it change their relationship? All these questions await Cal, but, most importantly, why are you still reading the description? You should already be listening to chapter one! so I really the love d-list supervillain series. is one of my all-time favorite book series out there at this time. I really enjoyed this book but I don't know if it's because we had to wait for some long for it or if or for other reasons that I can't quite put my finger on it this book from a little lacking. That is of course in comparison of the other books in the series which I absolutely love. Jen this is a great book and I had a lot of fun but I listen to it twice right in the world. However there's just something missing not a hundred percent sure what it is but it was missing. if you're a fan of the series you will like this book and you might have a different feelings I love the book and I still I'm going to listen to this one over and over again like I have the others, but I am wondering what else that could have been put in to make this book complete. But that's just my own opinion. The story moves along in a fun way, but it's too short to warrant a credit. I know the previous books weren't much longer in length, but in order to handle the recaps (which weren't excessive and were generally fun) etc., later books need more meat, not less. Of all the series I've read in installment form, this was the closest to being offensively short and I almost returned it in protest. If the author/publisher pulls this again, I won't hesitate to return the next book. Keep up the good writing, but have some integrity and respect for fans. 13 sur 14 personne(s) ont trouvé cet avis utile. I’m a huge fan of this series, but hesitate as they are short. In the past they were short but complete. This one is not. It doesn’t finish even one of multiple storylines. Audible should give the next book for free. I won’t return it as I enjoyed what their was—but shame on this author. Would it have been horrible to finish the story? I believe I’m out on this series. In short, wait for the next one, and spend two creds then. Total cliffhanger. Feel like half a story with no real point. Sadly, narrator was a little flat. This is my least favorite of the series so far. I thought it was too short and the secondary storyline was never dealt with. What seemed like the most important part of the story was simply pushed off to the next episode - this should have been included and made into a bigger novel. I liked it enough to keep with the series of course, but I wanted a more out of this one. I wanted the arc of a novel and felt like I got a novella. A fine addition to a good series but the ending always comes too soon. The biggest problem is waiting for the next book. Overall this was fine but it felt like the end came in the middle. the first book had multiple short episodic sections this one felt like that but without the actual conclusion.